Yoga for children supports motor skills, language acquisition, and social-emotional development while having fun. 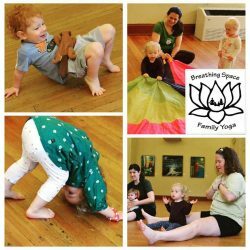 Breathing Space yoga for babies and toddlers classes incorporate playful, age appropriate poses, breathing exercises, movement games, rhythm, and songs for little ones and caregivers to do together. 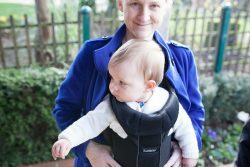 for walking through 3 year old toddlers with parents and caregivers. Learn more. Classes for crawling babies and older toddlers and families are offered in multi-week class series; registration is required, no drop-ins. Enrollment includes little one & up to two (2) caregivers weekly (parents, grandparents, nannies or other caregivers welcome). Sibling discounts automatically apply. Nanny shares welcome (10% discount). More class policies. Winter classes begin January 11 – Drop in on Nov 29 or Dec 5 to try it out! Cheverly Maryland classes are offered by Breathing Space thorough a partnership with Wildflower Yoga at Cheverly United Methodist Church, 2801 Cheverly Ave, 4th Floor (yoga room).